Good project development always keeps an eye on more than just the property. What constitutes a good piece of property? One that fulfils the needs and demands of those using it – in every way, from the moment the planning begins and throughout the entire period of use. For the tenant as well as the operator. The buyer as well as the landlord. A sustainable utilization concept is the first step to ensuring the firm, viable foundation of a property. gsp STÄDTEBAU is one of the leading project development companies in Berlin, a position that the firm has held for over two decades, ever since entering the field in 1992. gsp STÄDTEBAU is a proven and reliable partner for all aspects of property development, from project initiation to risk assessment, from project management to the marketing and transfer of property. Good project developers are jacks of all trade and specialists in one. Attributes gsp STÄDTEBAU not only claims to have, but promises to deliver. Through professional communication with all project stakeholders from all fields and trades involved. Through the commitment to maintaining the highest possible standards of quality, both during project implementation as well as from the viewpoint of the property users. Premium project development requires professional expertise, reliability, and a good hand with a broad range of people – gsp STÄDTEBAU delivers that and more. gsp STÄDTEBAU specializes in property development for housing, hotels, offices and public buildings. A selection of projects is presented below. 47 floors with space for 401 residential units, from small apartments and practical family residences to exclusive penthouses. Friedrichstraße and the Mall of Berlin on Leipziger Platz are just a few steps away: the new residential building on Gabriele-Tergit-Promenade will house approximately 200 attractive two-room as well as spacious three- and four-room apartments. Perfect for young families. Located in one of the most beautiful residential areas of Lichtenberg, in close proximity to the neighborhood of Friedrichshain and the river Spree. With top-quality building materials and timeless architecture, gsp STÄDTEBAU has created a true eye-catcher and enrichment to the neighborhood. Quiet living in Pankow, yet within walking distance to Kollwitzplatz. The modern architecture of the building reflects the sophistication and quality of its amenities and features. Rigaer Straße 67 is in the new heart of a traditional Berlin neighborhood. The residential building in Friedrichshain combines timeless architecture with the modern requirements of urban life. The first hotel to receive a Silver Certificate from the DGNB (German Sustainable Building Council). 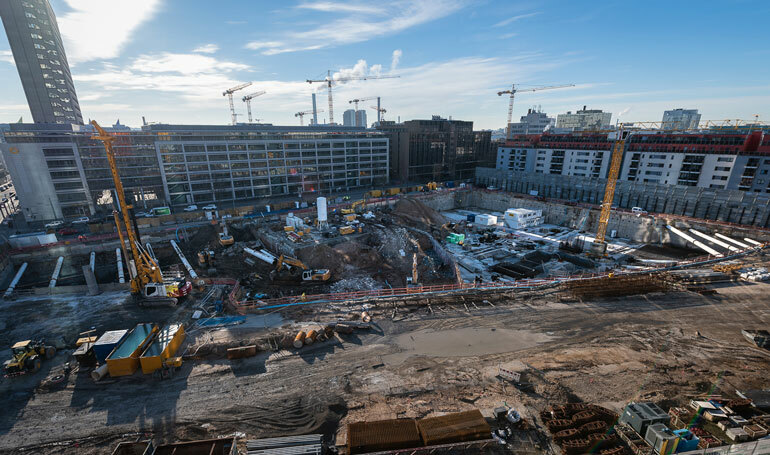 With the Scandic Hotel in Berlin, gsp STÄDTEBAU has fully and persuasively met the needs and requirements of the Swedish contractor. The Scandinavian flavor of the architecture is echoed in the Swedish interior design of the hotel's 565 rooms. gsp STÄDTEBAU has transformed the architecturally impressive 19th century building, with its exemplary neo-Gothic brick facade, into a museum structure fit for one of today's most important maritime collections. Distinguished architecture with excellent space efficiency and plenty of light for a first-rate work environment at Potsdamer Platz. Conversion of a former industrial complex into a unique and inviting location of notable commercial and residential amenity value. Located in the new heart of Berlin, the Park Kolonnaden is distinguished by a technically sophisticated architecture featuring a free-standing frontage building and a series of subsequent, interconnected office buildings, the latter of which anchor the structural continuity of the ensemble. Here, gsp STÄDTEBAU has reduced superfluous design elements to create a truly exceptional building with exemplary precision of form: the natural stone façade and clear-cut, large-scale openings convey a representative ambiance complementary to the building's business and residential use. Recipient of the AIA Chicago Distinguished Building Award. Built in 2000, this office building is still ahead of its time. Now as then, it is a synonym for the power of innovation as well as the openness to new technological developments. Conversion and redevelopment of a former industrial site into center for services and insurance products. Architecture is the determining force of a piece of property. It is an expression of quality and sustainability. Architecture has the power of earning and increasing value, providing it never loses sight of the user of the property. gsp STÄDTEBAU unfailingly works with renowned, reputable and internationally experienced architects and, consequently, over the past decades the projects of gsp STÄDTEBAU have assisted in shaping the present-day appearance of the nation's capital. Neues Kranzler Eck, Treptowers, Park Kolonnaden and Hotel Scandic (both at Potsdamer Platz) – names, one and all, that speak for themselves. The residential buildings developed by gsp STÄDTEBAU observe the needs of the users as well as the future development of the city. High-quality development also translates into quality of living for the residents: this includes maintaining high standards (for example, KfW 70 energy-efficiency construction and silver certification from the DGNB [German Sustainable Building Council]), as well as the integration of the special needs of the property purchaser and/or challenging property locations. The timelessly modern architecture of the projects of gsp STÄDTEBAU reflects the high standards in quality and the attention to real needs and use. Tower 90 – new residential Skyscraper with hanging gardens in Frankfurt. Further info on Tower 90. Grand Tower – Germany's Tallest Residential High-Rise. Further info on Grand Tower. High Park Potsdamer Platz – High Level Living. Further info on High Park. Thulestraße 40 is within walking distance to Kollwitzplatz.